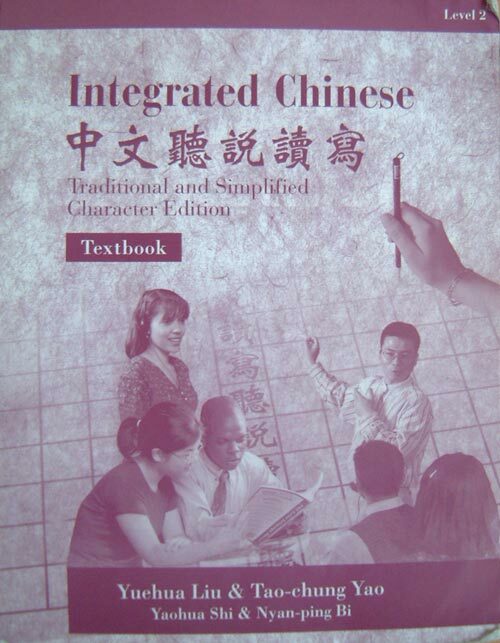 This is the series I used at University of Florida when I first started studying Chinese. I used a different book for my first year, and used this one for half a year before coming to China. This book is excellent for the intermediate learner. I didn’t realize it at the time, but every vocabulary word in this book is useful. You may not realize the significance of that statement, but a lot of books will teach you words that are overly formal or outdated. This book teaches great real vocab. I felt stupid for not studying this book harder before coming to China, because again and again I’d learn a “new word” in some real life context in China only to later discover that it was in this textbook all along, and I just hadn”t learned it well. This book is great. The book follows the typical “new vocabulary, dialogue, grammar explanations, drills” pattern, but it does a good job of it. This book uses both traditional and simplified characters. All dialogues, vocabulary words, and sample sentences in the grammar sections and drills are written in both character sets. You can choose which you want to study, or study both. It”s great. I highly, highly recommend this book. I have never seen it for sale in mainland China. For a teacher’s viewpoint, don’t miss Prince Roy’s guest review of this series. I totally agree with you about the usefulness of this book. I studied it at FSU and I brought it with me to China and review it off and on, and I was always impressed at how essential the vocabulary approved to be. On the other hand, living in northern China as I do, I wished the book had emphasized northern pronounciation more, since the northern use of the “r” final sound threw me off a lot when I first came here. I find A Study Tour For Learner’s of Chinese to be a very good and useful book for beginners like me. sorry to bother you with questions, but I went looking for this book and I found myself spoiled for choice. Would you mind adding a amazon.co.uk link to your blog entry pointing to what you recognize to be the correct book? I’m really keen on checking this book out as I’ll be in China in 7 months time, and want to do as much as possible to prepare in advance. It’s great for college students, but some high schools have begun to use these textbooks and I’m not sure how well the content applies to them. It’s harder for them to ‘connect’ to the story lines in the lessons since they are still in HS.